Jignesh Shah, who is fighting legal cases in the NSEL's Rs 5,600-crore scam, has resigned as the Managing Director of Financial Technologies India, a company set up by him, and will become its Chairman-Emeritus. The FTIL Board in its meeting held today appointed Prashant Desai as new Managing Director and CEO of the firm. "Jignesh Shah will no longer hold any executive or managerial position in the company. ...Board invites Shah to be Chairman-Emeritus and Mentor to nurture and inspire entrepreneurship," FTIL said in a statement. FTIL said Shah will hand over the baton to the next generation. Desai, who joined the company in 2013 as President (Investor Relations and M&A), will assume the position of MD & CEO of the Company with effect from today, it added. Congratulating the new MD & CEO and Board of Directors, Shah said: "When we started FTIL, we had only one vision - to make Indian technology IP and brand among the most respected in the world. ...Today as we pass the baton to the new generation of leaders of FTIL, that vision remains unchanged as we move in to next trajectory." The Board also approved appointment of three non-executive directors -- Nisha Dutt, Sunil Shah and Miten Mehta, and two executive directors -- Jigish Sonagra and Rajendra Mehta. Manjay Shah and Dewang Neralla will exit the Board. Both of them will become Managing Director and CEO in two FTIL group firms -- Atom Technologies and Tickerplant, it added. "The re-constituted Board of 12 members will have five Non-Executive and Independent Directors, four Executive Directors and three Non-Executive Directors," it said. 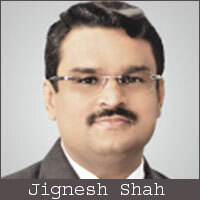 FTIL was founded by Jignesh Shah together with two colleagues as a technology provider for financial markets. FTIL is in trouble ever since the Rs 5,600 payment scam surfaced at its group firm NSEL in July last year. After the commodity markets regulator FMC order in December 2013 declaring FTIL and Shah as unfit to run any exchanges in view of this scam, the group has started exiting from the exchange business both in India and abroad. Since the beginning of this year, FTIL has exited MCX and IEX and few other bourses in overseas. It has sold its entire 26 per cent stakes in the commodity bourse MCX for about Rs 900 crore and also sold nearly 26 per cent stake in IEX for Rs 576.84 crore. Moreover, FTIL had sold its stake in National Bulk Handling Corp for Rs 242 crore. Meanwhile, the government has proposed a merger of NSEL with FTIL to ensure faster recovery of dues, which the company has challenged in the court. In August, the Bombay High Court had granted conditional bail to FTIL founder Jignesh Shah in the Rs 5,600 crore NSEL scam three months after he was arrested in the case.